Pediatricians would tell you that it's OK if, one day, your toddler is being very picky and won't eat her fruits or her vegetables. As long as, over the course of one week, she will have eaten enough to provide her with the necessary nutrients, vitamins, and calories she needs.This is what I call "balancing out". The other key is portion control. Coming to the US, the size of food portions struck me at disproportionate, if not outrageous! I remember having lunch with my parents at the mall in Syracuse, NY one day. My dad had ordered a chicken salad that was SO big that the three of us could have shared it and felt full. And it was only a salad, not the hamburger&fries some other customers were ordering. Yes, I know, we can doggy-bag everything in most restaurants in the US... but still, it's not a reason to serve 800-calories-plus entrees! Bigger is better does not work when it comes to feeding adults, let alone children! Désolée! It's hard to know how much is just right or too much (especially for children).. and it's even boring harder to try to count calories. If you want to know, a 3-year-old child with moderate physical activity needs about 1,200 calories per day... so my only rule-of-thumb is "don't overfeed, cut unhealthy snacks, and use smaller serving plates/dishes". I am not kidding with the dinnerware! It really helps reduce the quantity of food intake while maintaining the psychological aspect of "enough food". Reading the label helps control portions as well! You see, there are people in the agro-business whose job is to make you feel that what you are eating is low in calories and healthy when it is not! I know, I have a business background! Start reading the label, especially if you purchase processed food, cookies, frozen desserts, etc. I cook from scratch as much as possible... because, even "less nutritious food" cooked from scratch is healthier than the same food purchased in a store. Less sodium, fewer "additives", etc. We only have pizza (or quiche Lorraine) once every other week alongside a salad. If we have pizza on a Friday evening, then I try not to have a "bagel for lunch" or wheat pasta on Saturday and Sunday. I try to cook wheat pasta once every other week. We can have spelt/quinoa/rice/buckwheat pasta if I need to serve pasta... but I generally keep the whole wheat pasta for "emergency dinners", you know when you have absolutely NO idea of what you are going to cook or/and you only have 15 minutes to prepare it! Oh yes, it happens to me as well! I tend to cook a meal with animal proteins (fish, seafood, meat, poultry) every other day (and only once a day). While I am no vegetarian, I don't crave meat and I really think it's not necessary to have animal proteins everyday. To the contrary! I serve processed food only if I have no other idea that is every day about once every other week (fish fingers, frozen dumplings). I never give my children cookies, candies or chocolate before going to bed. They can have a few for their four-o'clock goûter (but not everyday). I serve them ice cream about once every other week as dessert (i.e., at the end of the meal, not an hour after their meal) or when we go out. During the summer, they might have more and as their 4-o'clock snack but a SMALL portion and preferably a fruit-based sherbet or water ice. If we have cake/pie for dessert one evening, I make sure they eat fruits on the side and the next day. We eat French fries when we take them out or if we cook mussels; I do cook sauteed potatoes about once a month though. If I make a cheese soufflé or a quiche Lorraine, then I'll try not to cook anything calling for a lot of eggs during that week. My husband and I eat (almost) the same meals and I pack the leftovers for lunch the following day. 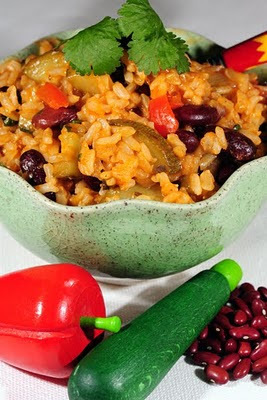 This Brown Rice and Beans recipe is a perfect example of an healthy (no butter, no cream, a lot of veggies, wholegrain), easy-to-make vegetarian dish that you could serve during the week. You don't need extra animal proteins since the beans are providing enough. You could serve it the day after/a day before you served/serve a meat/fish-based meal. It's comfort food for me! Bon Appétit! In a saute pan, saute the onion and garlic in olive oil. Add the red pepper, the carrot and zucchini, saute until the carrots are cooked. You could cook the recipe in a risotto-like way (cooking the rice with the vegetables in a broth). However, be aware that brown rice takes longer to cook. My husband and I add hot pepper/hot sauce to this dish to spice it up a little. i love this post--such good common sense! Great blog! And great advice in this post. Tous tes conseils semblent de bon sens ma foi! Et pour les enfants, notre médecin à Bordeaux avait bien spécifié qu'ils ne devaient pas prendre de protéine animale le soir avant 6 ans, ce qui ne nous posaient pas de problème car comme toi on ne fait jamais de viande ou de poisson le soir! Sauf exception (petite tranche de jambon ou de saumon!). Bon depuis le début du régime hyperprotéiné du "pater familias" on a du poisson tous les soirs et notre nouveau médecin a dit que les enfants pouvaient en manger un peu... mais c'est sûr, PAS DE VIANDE le soir is a really good advice!